Inking on the Edge: New BasicGrey Challenges # 10..A colour Combo..Joy! 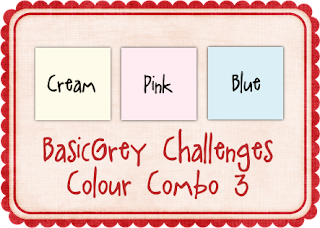 New BasicGrey Challenges # 10..A colour Combo..Joy! I'm back with another great challenge that we have for you over at the BasicGrey Challenges blog! It's a great colour combo and it works so beautifully with many different BG collections! The BG DT have really out done themselves again! I hope you can go take a look at all the fabulous inspiration they have for you and I hope you can join the fun! Just make sure you use at least one BasiGrey product on your creation with this colour combo and you are good to go!!!! For my card I made yet another easel card from Prism Kraft cardstock, Bazzill Basics Cardstock for matting and my beloved Eskimo Kisses 6x6 paper pad! I stamped Tilda on the Magnolia Holly Letter on ATS Copic Quality paper with Memento Tuxedo Black ink and coloured the image with my Copic Markers. I inked around the edges with Tim Holtz Distress Inks in Broken China and Faded Jeans and added a little Shimmerz to Tilda and the letter! To finish it off I added some Prima flowers with BG Eskimo Kisses brads, blue satin ribbon and pink half pearls! 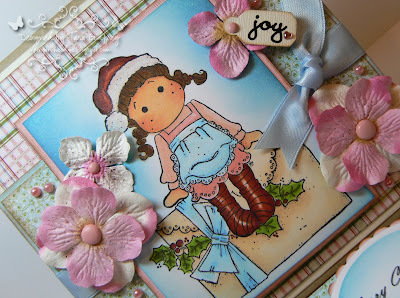 The sentiment "joy" is a Melissa Frances rub-on and "Merry Christmas" is from Susana's Custom Art and Card Special Edition Ornament set. So, there you have it another great challenge over at the BG Challenges blog! I really hope you can squeeze in some crafty time in between all the Christmas preparations! I can't believe how quickly this month is going by I wish I could put it on slow mode so I can get a few more cards made,smile! Well, thanks for stopping by and having a wee peek!!! Absolutely AMAZING Tara! I love it! Your easel cards are amazing! I just adore them to pieces...they are all wonderful! Love all your Tildas too! I am hoping to get some color time in tomorrow to play with mine! :) STUNNING creations hun! Tara your card is absolutely divine! Oh I could look at it forever it is so very beautiful! I too wish I had a slow mode button how quickly is December going! Ohhh wowww Tara,what beautiful,i love your image and colours. Your card is absolutely amazing, you are really the Queen of Magnolia ! 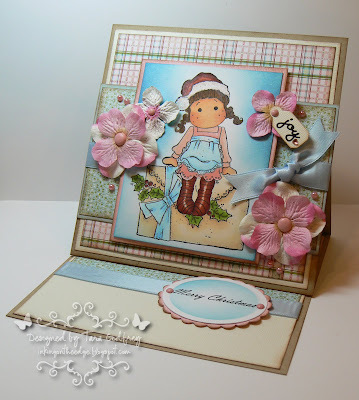 Just love the easel cards, such a fantastic way of displaying a beautiful image and all the details you have added. Another fabulous creation, Tara! Your cards are always packed with detail, and this is no exception. These papers look great for this colour combo, beautiful work! She's beautiful Tara! Love the present!